This is a variation on the Chewy Chocolate Chip Cookie recipe but if you are a sweeter tooth, and you like the subtle crunch of the macadamia nut, which I do, then the WHITE CHOCOLATE CHIP MACADAMIA COOKIE is for you. 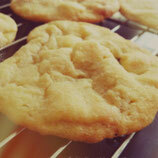 For general tips on baking drop cookies, check out the Chewy Chocolate Chip Cookie recipe. We go through what "makes" or "breaks" a cookie there so if yours aren't quite what you want, you can find some pointers there. So lets get to it. Warm up your oven to 140°C. Mix the butter and sugar together with an electric mixer, and when they start to come together add the egg and mix again until the dough is uniform. In another bowl, mix together the dry ingredients (flour, baking powder, salt, chocolate chips) and the vanilla extract, and pour this into the butter-sugar-egg mixture. Mix again on low, just long enough to bring everything together. The dough should be quite stiff. Either form balls of the dough with two spoons or use an ice-cream scoop, and flatten then slightly on the cookie sheet, a couple of inches apart. (A regular cookie sheet can take 9 to 12 depending on the size). Place in the oven for 15 to 20 minutes for large cookies, 9 to 14 for smaller ones. Once they are out, let them sit on the baking tray for a while before you place then on a wire rack to finish their cooling off. They are great a little warm with a glass of milk! M-Joy!